Scotland coach Vern Cotter insists there is "a lot more to come" from his team despite an eighth straight Six Nations defeat since 2014. 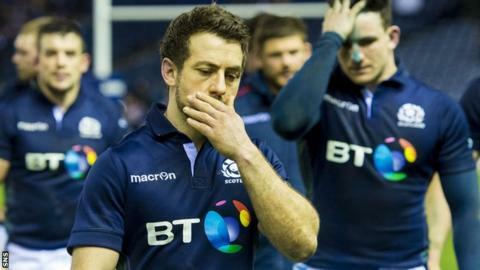 "We created opportunities but we didn't finish them off," he told BBC Sport after Scotland's 15-9 loss to England. "We can do better than that, we know we can, if we cut down some basic errors and become more accurate. "That game was there to be won, that is the cold, hard fact. If we get in a similar situation, we have to nail it." Cotter refused to be downbeat after suffering a sixth consecutive defeat in the tournament since taking over as head coach. He urged his players to swiftly put a seventh straight loss against England - who they have not beaten since 2008 - behind them and focus on next Saturday's match against Wales in Cardiff. "We weren't accurate enough, but there is a lot more to come from this team," he added. "The players are disappointed the way they let those opportunities pass, from lost balls and bits and pieces. "But those will be quickly identified and we need to put the frustration behind us. We can't do much about this one but we can certainly look forward to the next one." "That was an opportunity yet again that Scotland haven't converted into a victory. Decision-making, a lack of accuracy, keeping the ball, a bit of sloppiness in contact - it isn't one thing, it is a combination of a lot of things. I genuinely thought Scotland had turned a corner when it comes to scoring tries and they have found their mojo in attack in the last two years but it was almost like the white mist came over them and they just didn't know how to score. I would give them a rocket, but also give them another opportunity. That was Scotland's best team out there today, and we need to stick with them." Captain Greig Laidlaw lamented his side's failure to hold onto the ball at crucial moments, extending a try drought against England at Murrayfield stretching back to 2004. "I don't think there was much between the teams but in the second half there was probably a momentum shift," he said. "We coughed up a few high balls, that was a poor area for us, and I think we lost three of our line-outs as well. "When we held onto the ball in the first half, we were causing England problems and were right in it. "It is disappointing because we have been working on our concentration for 80 minutes. I don't know if it was that but we certainly made it easy for England in the second half. "We created opportunities in the first half - we cut them almost clean open with Tommy Seymour and if he holds the ball there, we would probably have scored in the next phase, but we coughed it up. "It is a simple game but if you lose the ball, you make it hard for yourselves."